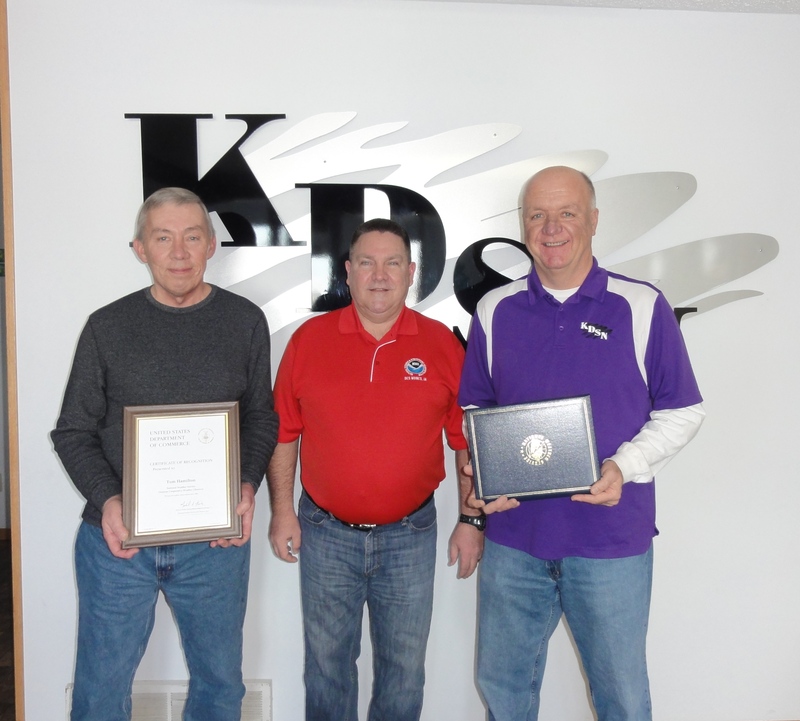 Tom Hamilton (left), KDSN radio, Denison…Brad Fillbach (middle), OPL, NWS Des Moines, Randy Grossman (right), KDSN radio, Denison. Randy Grossman receives his 35 year length of service award. Tom Hamilton has assisted Randy for the last 30 years. Tom was given a Certificate of Recognition. National Weather Service Des Moines partnered with Iowa Homeland Security and Emergency Management for Iowa Heat Awareness from June 6-10, 2016. Throughout the week, several partners assisted in promoting heat awareness and heat safety information. Iowa Governor Terry Branstad signed a proclamation highlighting heat safety and impacts. KCCI-TV, a CBS affiliate, conducted 6 live shots at the weather forecast office during the station’s morning broadcast on June 8th and interviewed Warning Coordination Meteorologist Kelsey Angle. National Weather Service Des Moines partnered with the Polk County Health Department for a vehicle heat demonstration on June 9th. Hydrometeorological Technician Brad Fillbach installed a Maximum-Minimum Temperature System (MMTS) radiation shield and display unit in a GOV vehicle. The demonstration showed how quickly the temperature inside a vehicle can change in a short amount of time. Polk County Health Department Educator and Public Information Officer, Nola Aigner assisted with describing the health impacts to children and pets. The demonstration was attended by local television stations and broadcast live by UnityPoint Health through their Facebook page. During the vehicle heat demonstration and throughout the week, the forecast office also provided updates and briefings through social media including Facebook, Twitter and Periscope. Forecaster Ken Podrazik, Meteorologist Intern Kurt Kotenberg, Meteorologist Intern Allan Curtis and Meteorologist Intern Kevin Skow provided 10 briefings through Periscope. 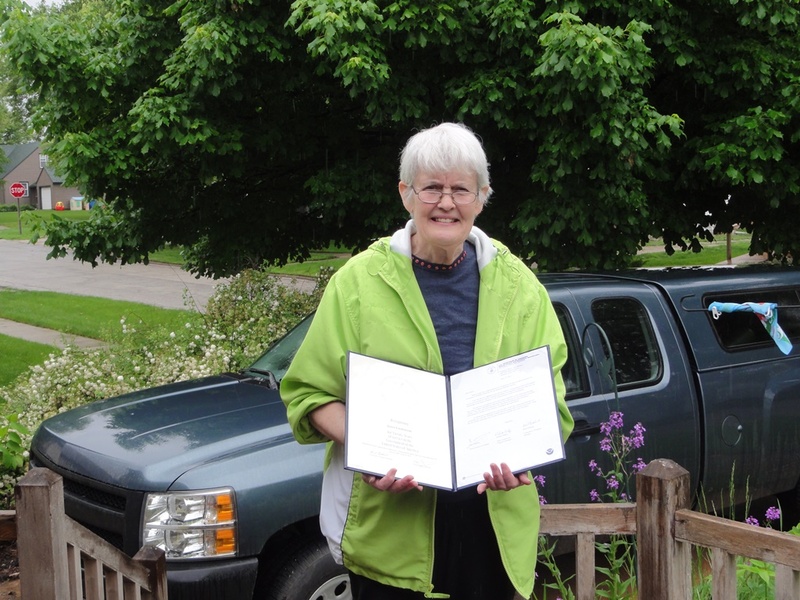 Bev Chaplin of Hubbard, Iowa receives her Benjamin Franklin (55 year Length of Service) Award. A large group of Bev’s family and friends attended the presentation. 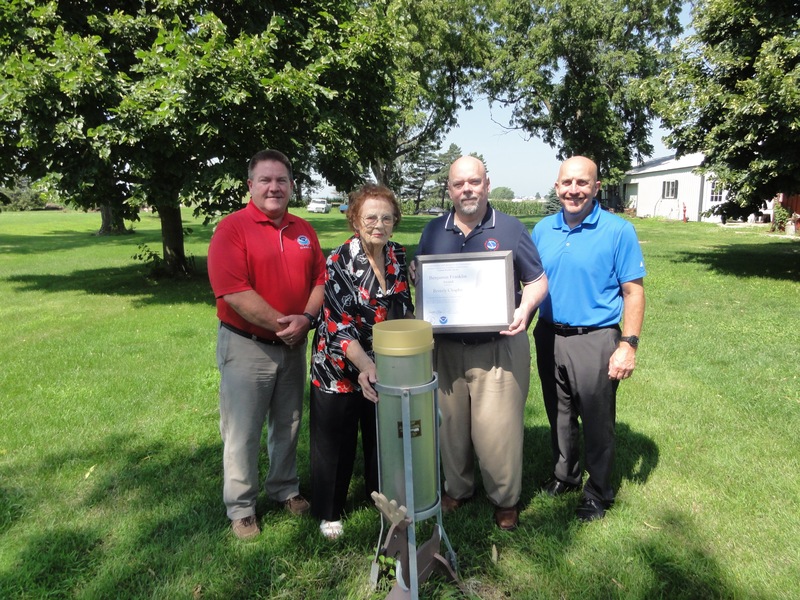 Picture (Left to Right): Brad Fillbach, Coop Program Manager (CPM), WFO Des Moines, Iowa; Bev Chaplin, Hubbard, Iowa; Ken Harding, Chief Program Officer, Central Region Headquarters; Andy Bailey, Acting Meteorologist-in-Charge, WFO Des Moines, Iowa. 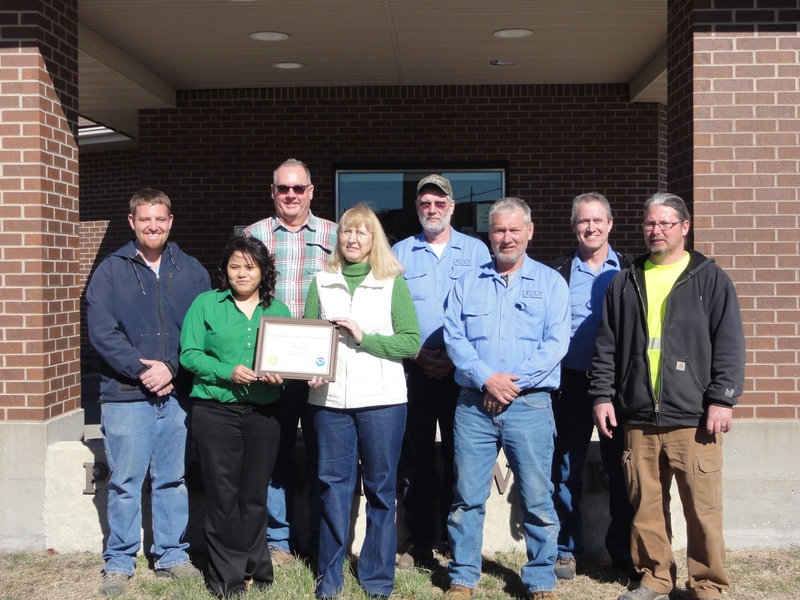 The staff at Perry Water Works in Perry, Iowa, receive their 25 year Institutional Length of Service award. Presenting the award is Brad Fillbach, CPM, WFO Des Moines, Iowa. To provide observational meteorological data in near real-time to support forecast, warning, and other public service programs of the NWS. The data is invaluable to an extensive climate database across the United States. Although the majority of the NWS observers take daily measurements of maximum and minimum temperatures, precipitation, and snowfall, there are other observers that provide soil temperatures, frost depth, river levels, and greenness or grassland curing data (for fire weather purposes). All this data that is collected from our volunteer observers helps several industries such as litigation, water resources, insurance, engineering and architectural, medical, manufacturing, communications, public utilities, transportation, agriculture, natural disasters/hazardous material mitigation, housing and real estate. We at the National Weather Service are extremely grateful and fortunate to have some amazing folks volunteer their time to provide such crucial data everyday. Length of Service Awards are given every 5 years to individuals or institution that have dedicated their time to help complete the NWS Mission. 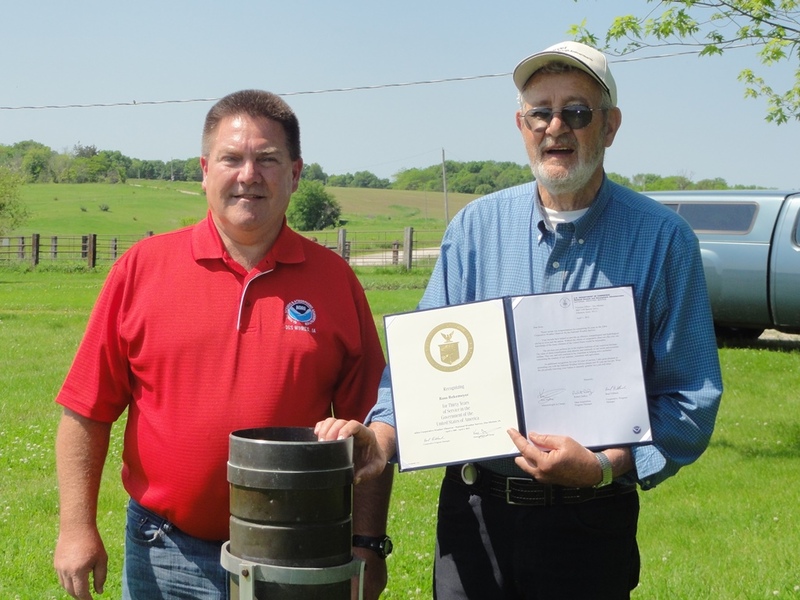 So far this spring 2015, the NWS Des Moines have presented four Cooperative Observer Length of Service Awards. Janet Lindstrom of Rockwell City receives her 20 year Length of Service award. Presenting the award was Brad Fillbach, HMT, WFO Des Moines, IA. Ross Rekemeyer of Albia receives his 30 year Length of Service award presented by Brad Fillbach, HMT, WFO Des Moines, IA. 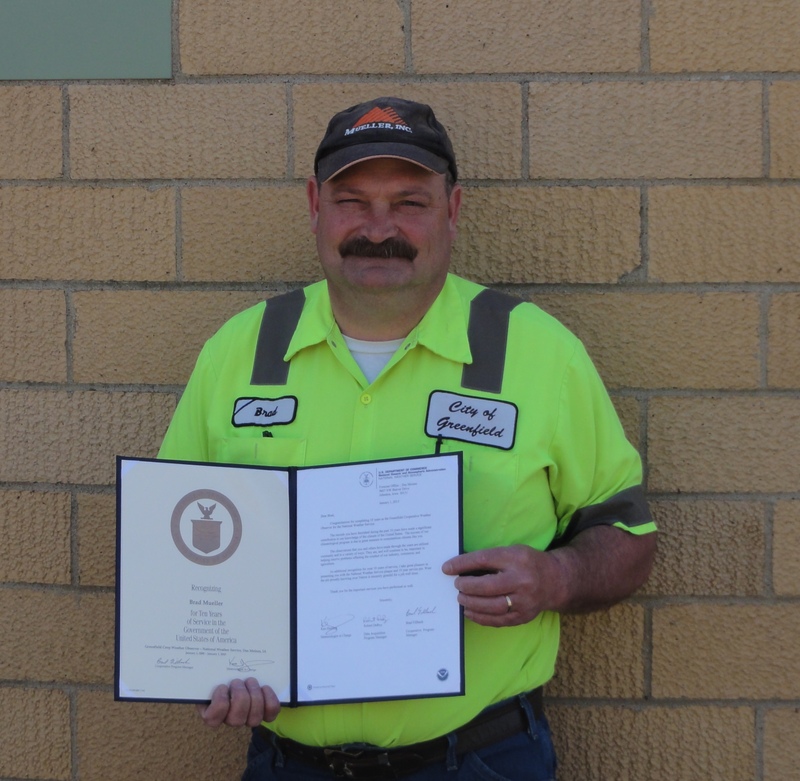 Brad Mueller of Greenfield, IA (pictured) recently received his 10 year Length of Service Award. Presenting the award was Brad Fillbach, HMT, WFO Des Moines, IA. 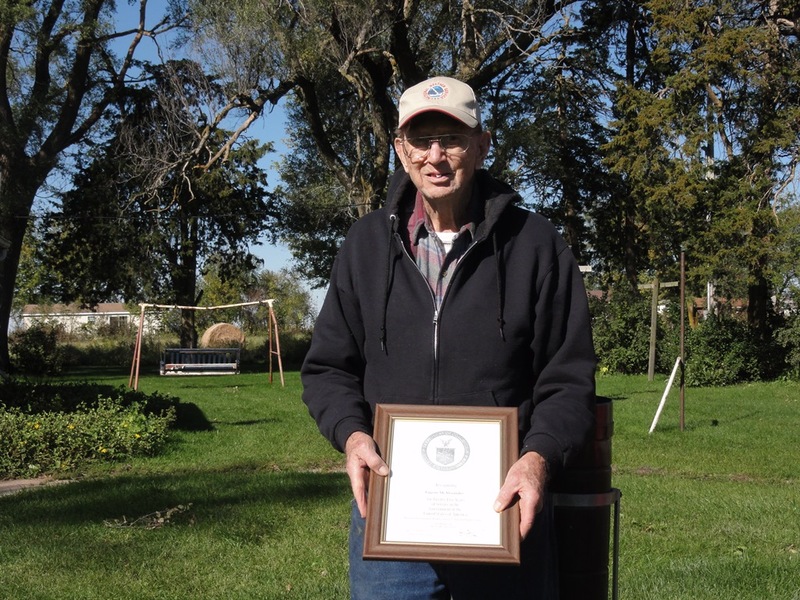 Robert “Lightning” Petersen (pictured) recently received his 30 year Length of Service Award. Presenting the award was Brad Fillbach, HMT, WFO Des Moines, IA. The data is invaluable to an extensive climate database across the United States. Although the majority of the NWS observers take daily measurements of maximum and minimum temperatures, precipitation, and snowfall, there are other observers that provide soil temperatures, frost depth, river levels, and greenness or grassland curing data (for fire weather purposes). All this data that is collected from our volunteer observers helps several industries such as litigation, water resources, insurance, engineering and architectural, medical, manufacturing, communications, public utilities, transportation, agriculture, natural disasters/hazardous material mitigation, housing and real estate. We at the National Weather Service are extremely grateful and fortunate to have some amazing folks volunteer their time to provide such crucial data everyday. Length of Service Awards are given every 5 years to individuals or institution that have dedicated their time to help complete the NWS Mission. 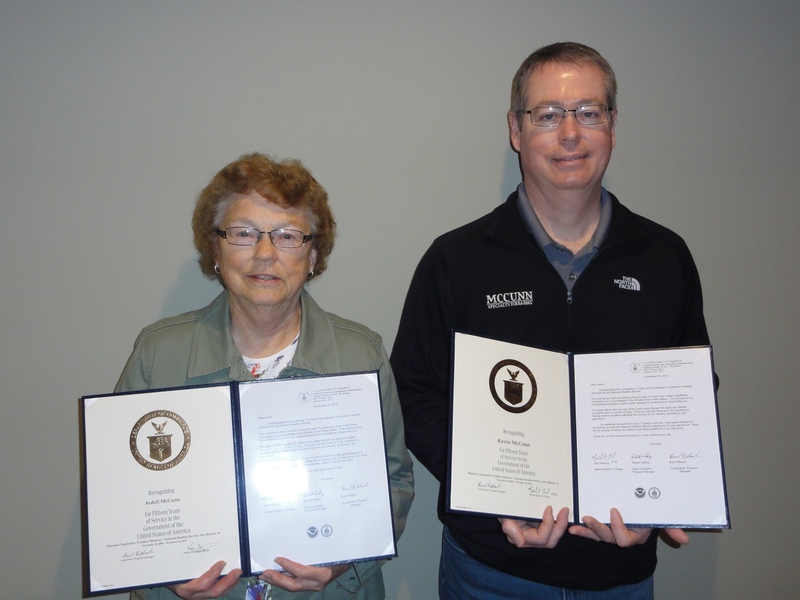 So far this spring 2015, the NWS Des Moines gave 2 Cooperative Observer Length of Service Awards. 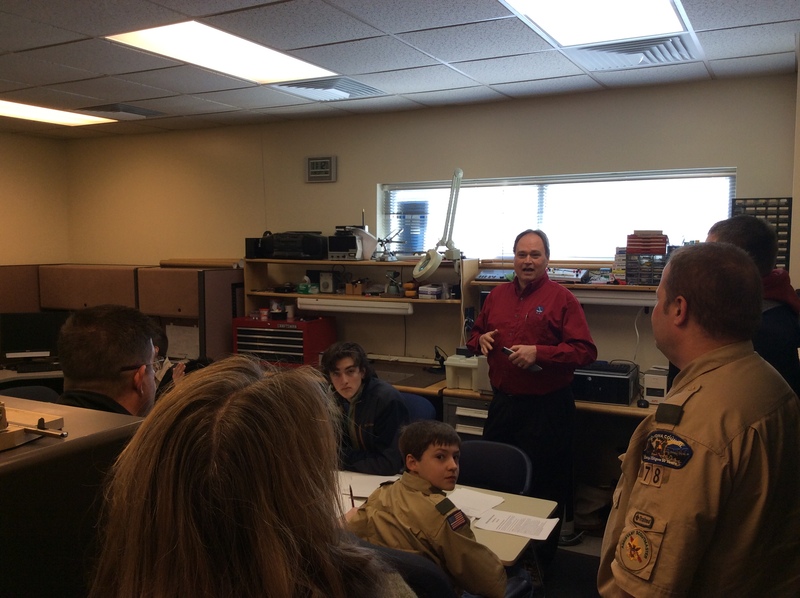 We had a record 111 scouts, leaders and parents attend this past Boy Scout Weather Merit Badge Day, which was held at the NWS Des Moines office on February 28. This program was started five years ago and for the last two years, we have had to add two more sessions, bringing the total from four sessions per day to six sessions per day. 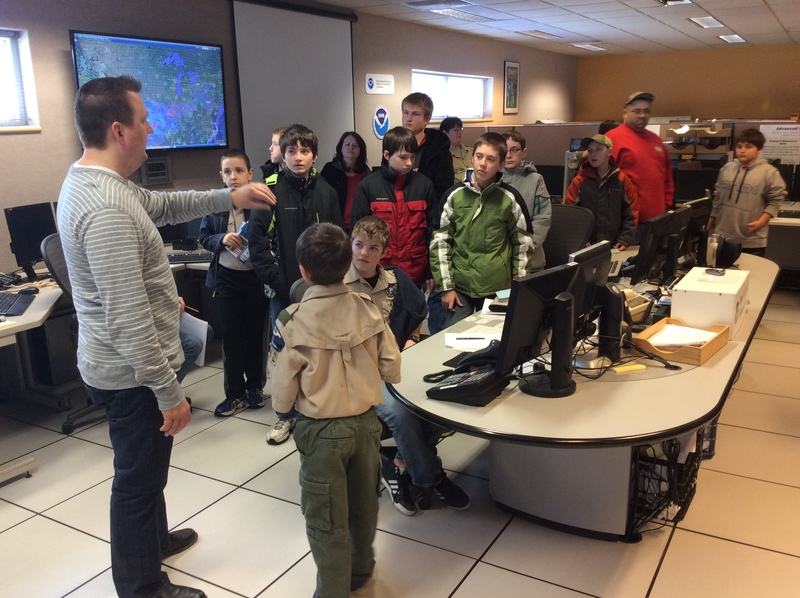 The course is designed to run through the weather merit badge requirements, talk about careers within the National Weather Service and in the field of meteorology, and provide guidance in the scout’s research assignments. The course does have a quiz at the end which the boys must pass in order to be signed off on the requirements covered in the session. 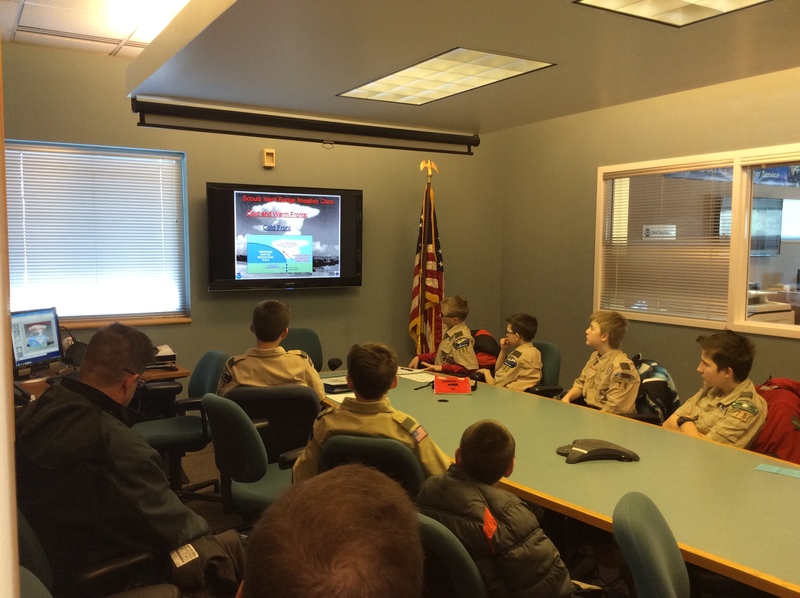 Forecaster Kenny Podrazik explains severe weather operations to the Boy Scouts. Meteorologist Intern Kevin Skow (not pictured), discusses thunderstorm development. Forecaster Frank Boksa covers the different types of careers in meteorology. 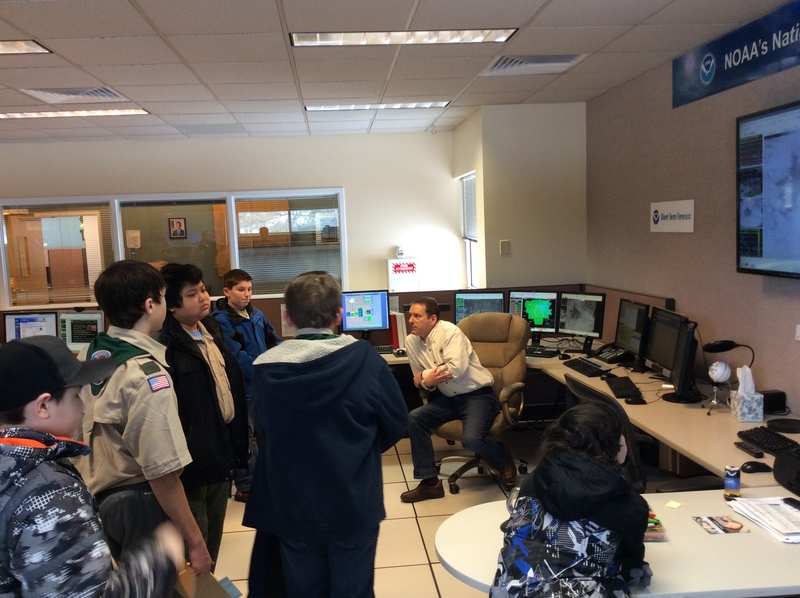 Senior Forecaster Brad Small answers some very challenging questions from the Scouts. The data is invaluable to an extensive climate database across the United States. Although the majority of the NWS observers take daily measurements of maximum and minimum temperatures, precipitation, and snowfall, there are other observers that provide soil temperatures, frost depth, river levels, and greenness or grassland curing data (for fire weather purposes). All this data that is collected from our volunteer observers helps several industries such as litigation, water resources, insurance, engineering and architectural, medical, manufacturing, communications, public utilities, transportation, agriculture, natural disasters/hazardous material mitigation, housing and real estate. We at the National Weather Service are extremely grateful and fortunate to have some amazing folks volunteer their time to provide such crucial data everyday. Length of Service Awards are given every 5 years to individuals or institution that have dedicated their time to help complete the NWS Mission. 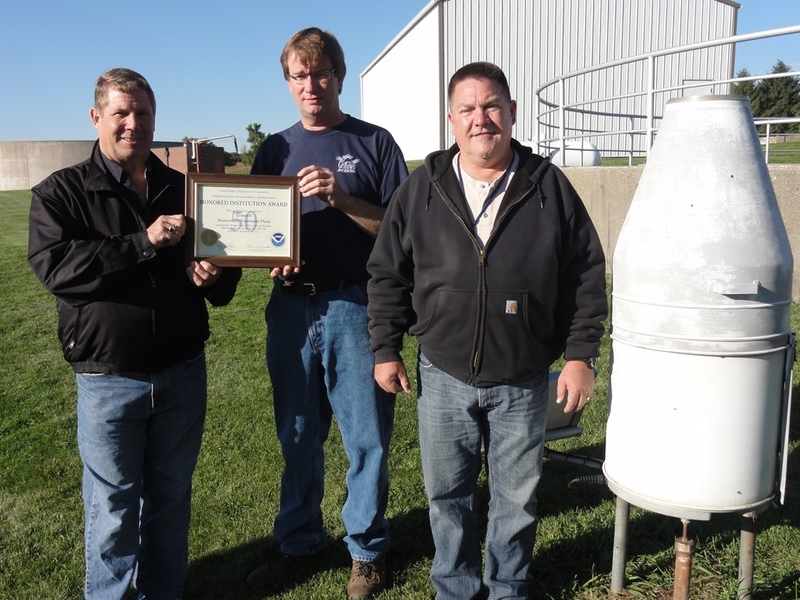 This fall (2014), the NWS Des Moines gave three Cooperative Observer Length of Service Awards. 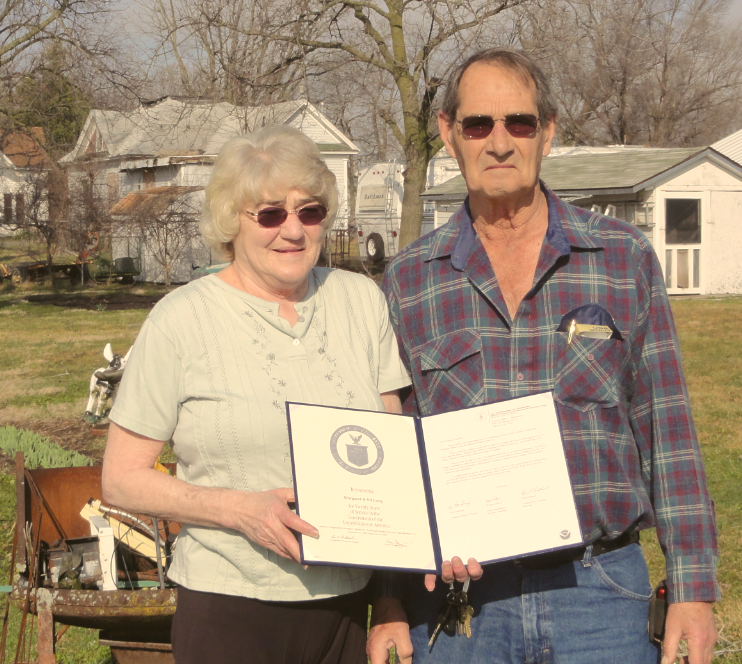 Eugene McAlexander of Beaconsfield, Iowa receives his 25 year length of service award. Eugene recently celebrated his 90th birthday as well as his 61st wedding anniversary to his lovely wife, Esther. Presenting the award was Brad Fillbach, HMT, WFO Des Moines. 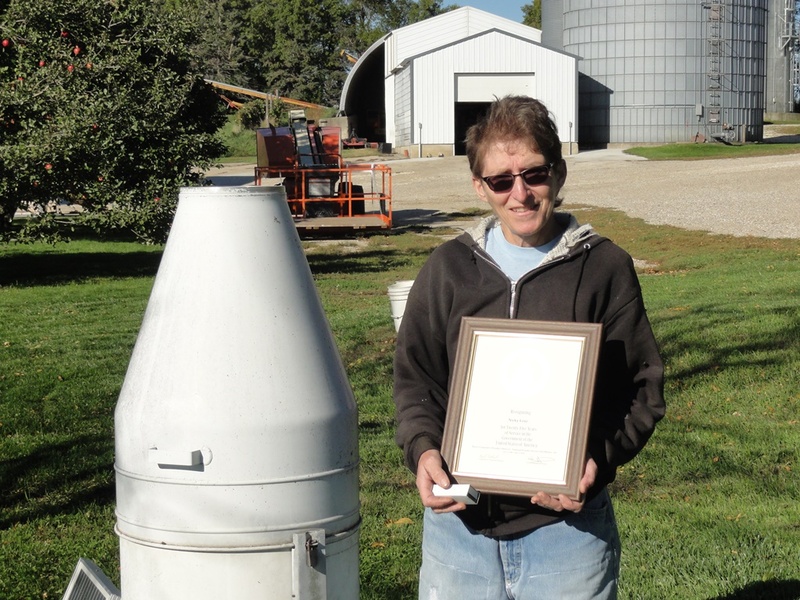 Nicky Lenz of Boyer, Iowa receives her 25 year length of service award. Presenting the award was Brad Fillbach, HMT, WFO Des Moines. 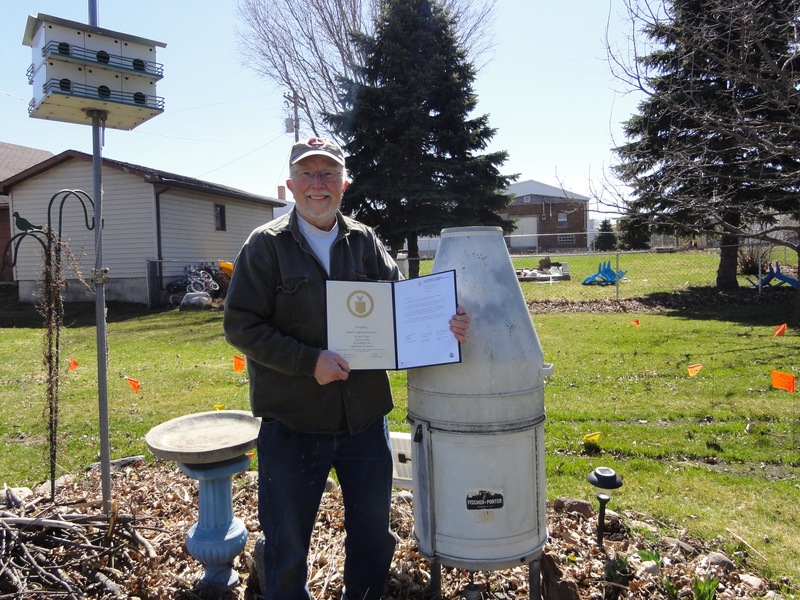 The Grinnell Wastewater Treatment Plant in Grinnell, Iowa recently received their 50 year Institutional Award. Brad Fillbach (right), HMT, WFO Des Moines presented the award to Jan Anderson (left) and Rick Graves (middle) with the Grinnell Treatment Plant. During the session Melinda Beerends (General Forecaster/WFO Des Moines) and Jeff Zogg (Senior Service Hydrologist/NWS Des Moines) discussed Decision Support Services and related tools the NWS can provide before, during and after weather-related and weather-sensitive events. In addition, they used mock scenarios to highlight the potential utility of NWS Decision Support Services and tools. They also engaged the audience to better understand the needs of NWS Emergency Management partners. The breakout session was well-attended and generated positive feedback as well as subsequent discussions between conference participants and NWS staff. Melinda and Jeff were joined by Ken Harding (MIC/WFO Des Moines), Donna Dubberke (WCM, WFO Quad Cities IA/IL) and David Cousins (Meteorologist/WFO Quad Cities IA/IL). 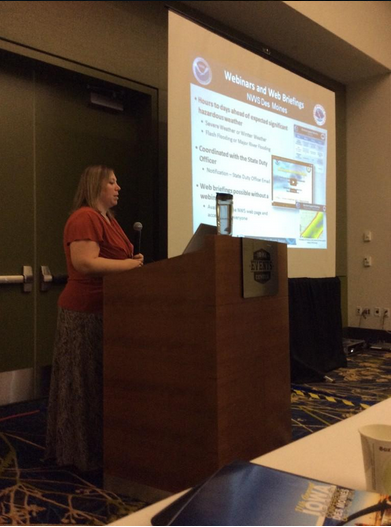 Melinda Beerends, General Forecaster, discusses NWS decision support resources with emergency managers. 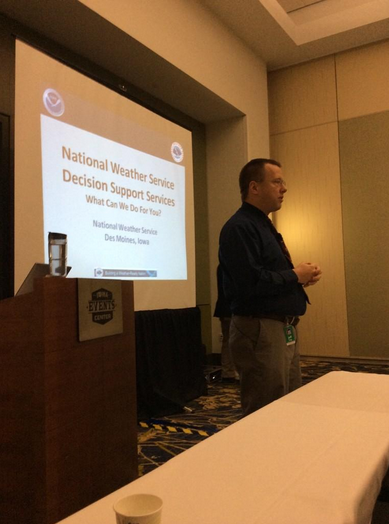 Jeff Zogg, Senior Hydrologist, discusses NWS decision support resources with emergency managers. July 17, 2014 Dallas Center completed a renewal of their StormReady® status. Dallas Center completed a set of rigorous criteria necessary to earn the distinction of being StormReady®. Dallas Center initially became StormReady® three years ago in 2008. The National Weather Service congratulates Dallas Center on maintaining their StormReady® status. 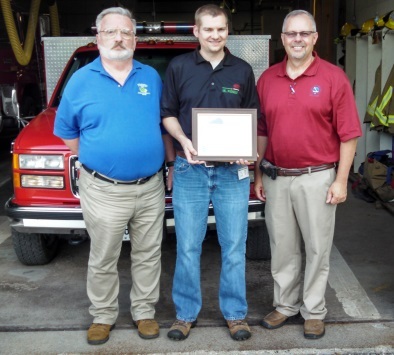 Pictured left to right: Barry Halling (Dallas County Emergency Management Coordintor), Dan Case (Dallas Center Fire Department) and Jeff Johnson (Warning Coordination Meteorologist – NWS Des Moines, IA).